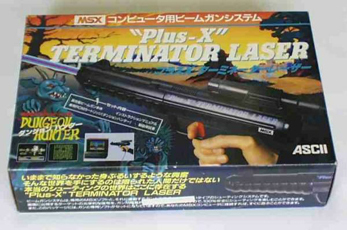 A very rare item in my collection is the "Plus-X" Terminator Laser lightgun from ASCII. I bought this item from RKlok Japanes retro games & consoles. The difference with the lightgun from SEGA, which is often used for playing Karoshi's 'Duck Hunt' remake for MSX, is that this lightgun is specially developped at the time (1989) for MSX. The lightgun package also includes the cartridge game 'Dungeon Hunter'. A beautiful shooting game with zombies, ghosts, spiders, bats, skeletons and many more. There are also other ASCII games developped for this gun, but they are hard to find on the internet. Recently I got some games from Repairbas, two disks with the games: Pig Race, Shooting en Air Shoot (air hockey). I tried to make .DSK files from them, but they are copy protected for that purpose. If you want a copy, please mail me. Note: this games won't work with the SEGA lightgun.